The PIC32MX250F128D PIM is designed to demonstrate the capabilities of the PIC32MX1XX/ 2XX family of devices using Explorer 16 Development Board. It enables USB and graphics development with the PIC32MX2XX series. 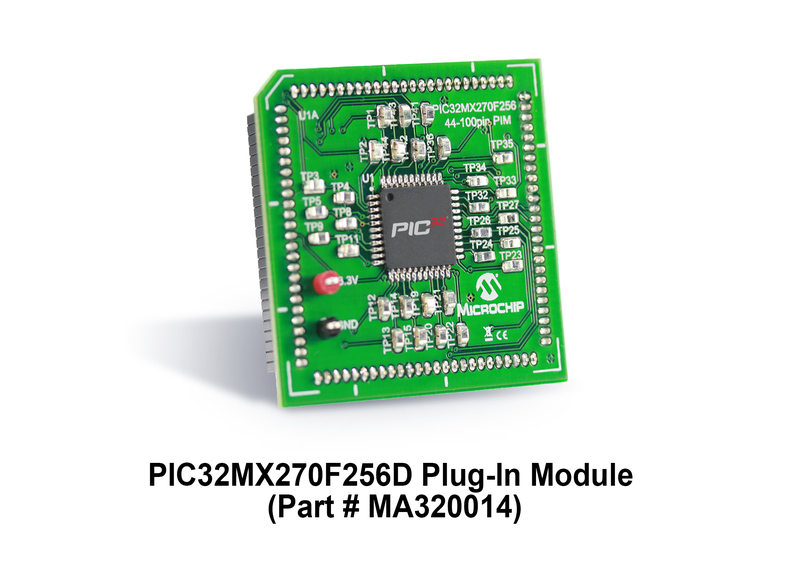 The PIC32MX270F256D Bluetooth Audio PIM is designed to demonstrate the capabilities of the PIC32MX1XX/2XX family of devices using the PIC32 Bluetooth Audio Development Kit. 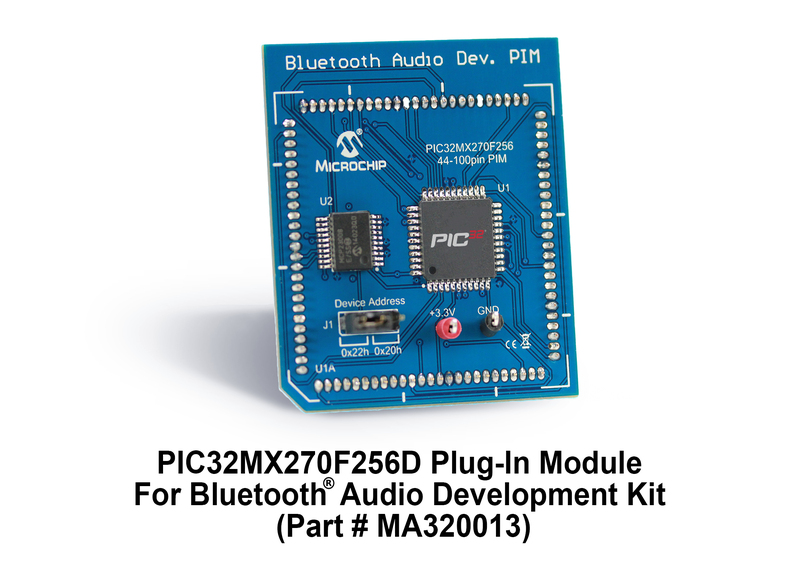 It enables Bluetooth and Digital Audio development with PIC32 Bluetooth Audio Development Kit. Note: This Plug-in Module is not compatible with the Explorer 16 Development Board. The PIC32MX270F256D PIM is designed to demonstrate the capabilities of the PIC32MX1XX/ 2XX family of devices using Explorer 16 Development Board. It enables USB and graphics development with the PIC32MX2XX series. The PIC32MX1XX/2XX family of devices is high-performance 32-bit microcontrollers in low-pin count packages. 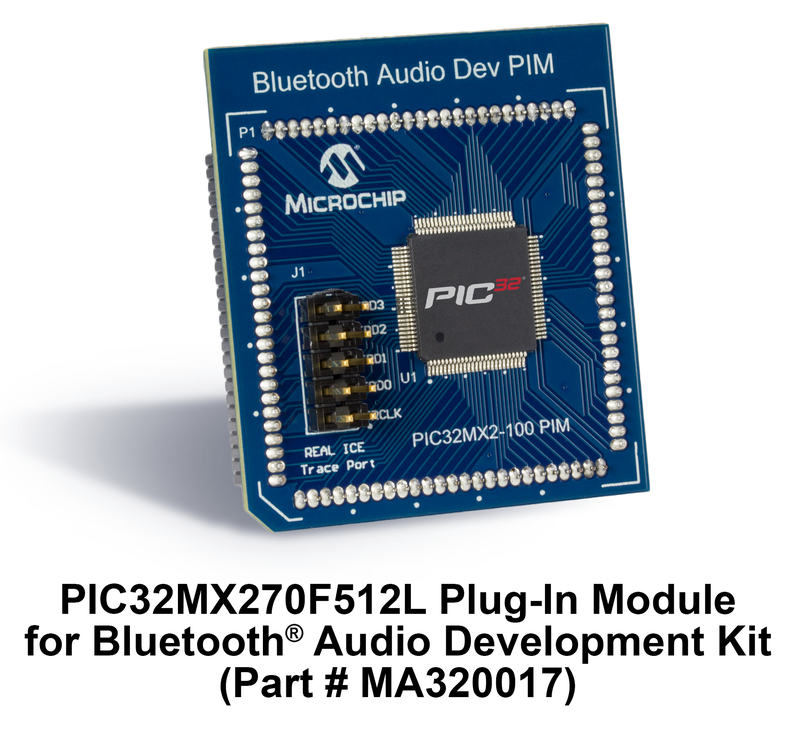 The PIC32MX270F512L Bluetooth Audio PIM is designed to demonstrate the capabilities of the PIC32MX1/2/5 family of devices using the PIC32 Bluetooth Audio Development Kit. 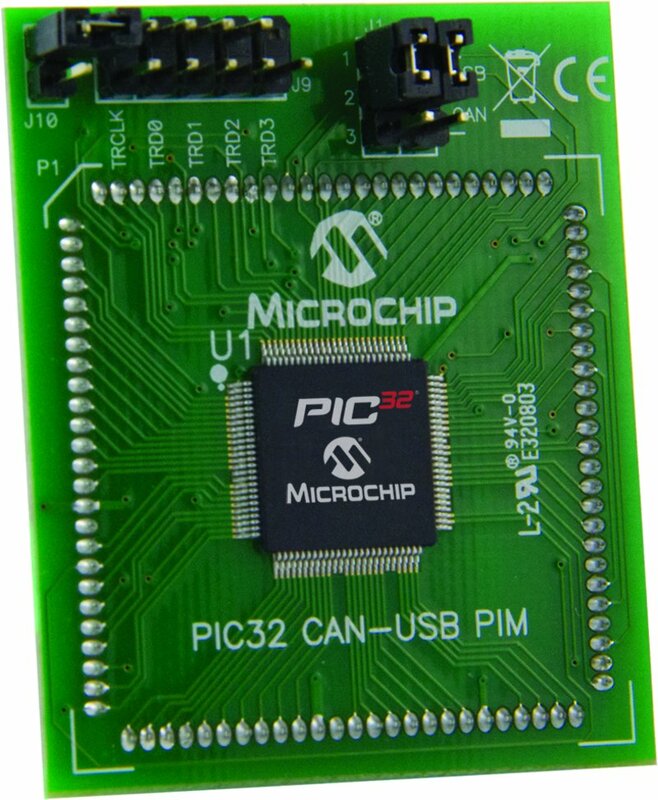 It enables Bluetooth and Digital Audio development with PIC32MX270F512L MCU using the PIC32 Bluetooth Audio Development Kit. This PIC32 Plug-In Module enables PIC32 development on the Explorer 16 development board (DM24000x) and supports the MPLAB REAL ICE Trace Kit (AC244006). An 80 MHz PIC32MX360F512L with 512 KB of Flash, 32 KB of RAM, 4 channels of hardware DMA, and instruction trace is installed on the plug-in module. The capabilities of PIC32MX3/MX4 family of devices can be demonstrated using the PIC32MX450/470 PIM using Explorer 16 development board. 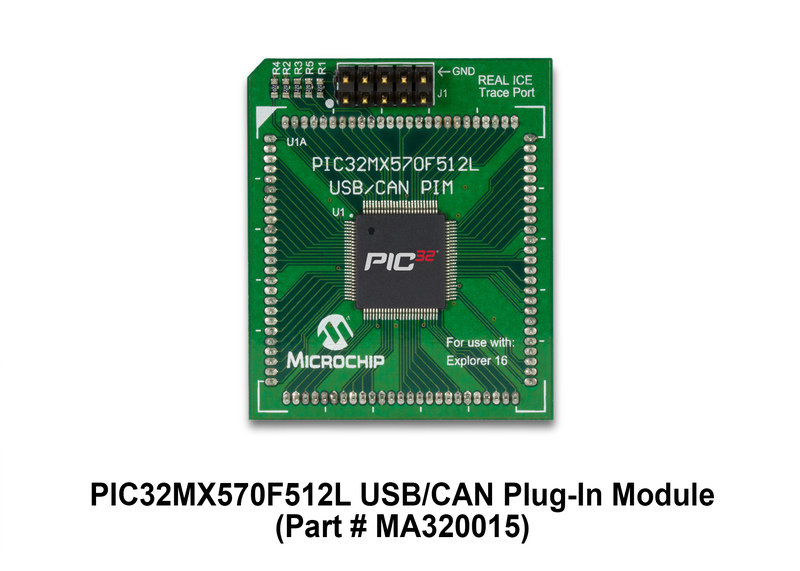 It enables USB development with the PIC32MX4XX series. This Plug-in Module enables USB development using a PIC32, Explorer 16 development board. Requires USB PICtail+ (AC164131) for connecting USB hardware. An 80 MHz PIC32MX460F512L with 512 KB of Flash, 32 KB of RAM, USB On-The-Go controller, 4 channels of hardware DMA and instruction. The capabilities of PIC32MX1/2/5 family of devices can be demonstrated with the PIC32MX570F512L PIM using Explorer 16 development board. It enables USB and CAN development with the PIC32MX570F512L MCU. Processor Plug-In Modules are small circuit boards to be used with the various Microchip Development Boards to evaluate various MCU families. 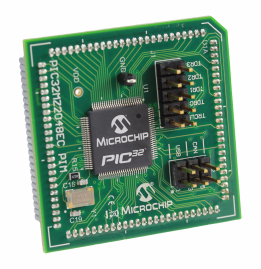 These plug into the main processor socket of the Development Boards so that different microcontrollers can be used for prototyping, demonstration or development --quickly and easily. .